VOOPOO Drag 157W TC Box Mod Black Resin version is a dual 18650 batteries powered mod which has a black zinc alloy frame and colorful resin panel. The Gene Chip inside the DRAG provides a full temperature control suite with a maximum power of 157W and a firing speed of 0.025 seconds! The Box Mod is an ideal vaping device for users who are looking for some serious power output with minimal fire delay! 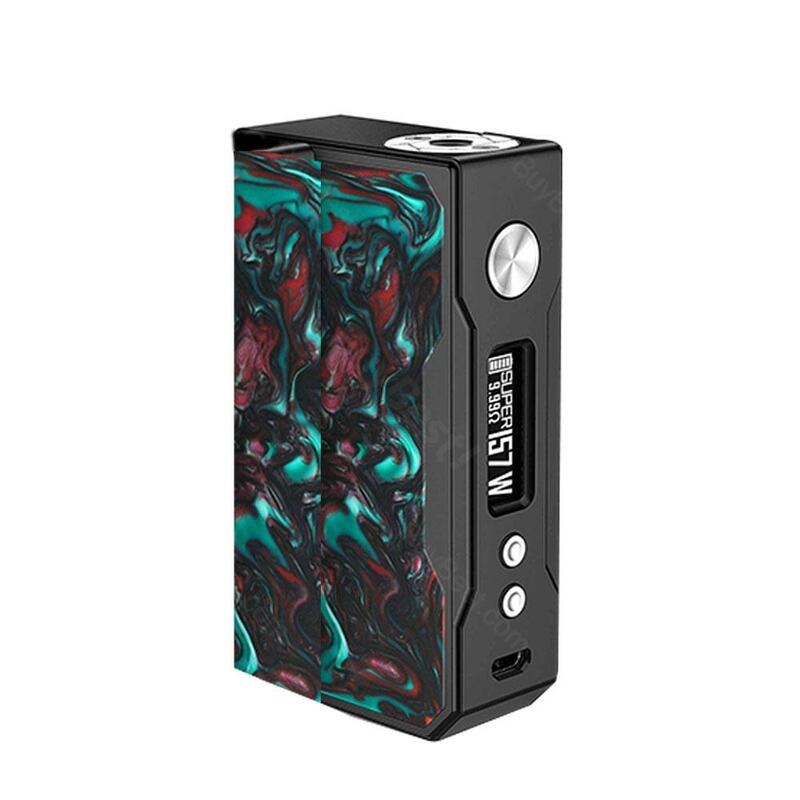 VOOPOO Drag 157W TC Box Mod Black Resin version is a dual 18650 batteries powered mod which has a black zinc alloy frame and colorful resin panel. The box mod is compatible with the VOOPOO PC App for full customization and fine tuning settings. The Gene Chip inside the DRAG provides a full temperature control suite with a maximum power of 157W and a firing speed of 0.025 seconds! The VOOPOO DRAG 157W TC Box Mod is an ideal vaping device for users who are looking for some serious power output with minimal fire delay! • Power on/off: Press the fire button 5 times in quick succession to turn the device on and off. • Mode Switch: Press the fire button 3 times quickly, the four interfaces can be switched orderly under normal startup condition. Constant power and temperature control SS/Ni/Ti. • Temperature Adjustment: When the temperature was set to 100℃, keep on pressing the down button, temperature will turn to 600F. When the temperature was set to 200°F, keep on pressing the down button, temperature will turn to 315℃. Quickly press the fire button 4 times can get into wattage adjust interface. Then you will see the letter "W" is flashing. The adjustable wattage is 5W to 80W. • Function Menu: Press uo and down buttons simultaneously for 1.5 seconds, enter the function menu interface. Press up button or down button simultaneously to choose th function. Press the fire button to make confirmation and go to next step. • Customization Mode: Press up and down buttons simultaneously for 1.5 seconds, the device will go to the function menu interface. Press up and down button to choose the Customization Mode and press fire button to go into Customization Mode interface. Under Customization Mode, press fire button 3 times continuously, 4 kinds of Customization Mode can be switched sequentially: Stable Power Mode, Temperature Control Mode:TC-SS316/TC-Ni200/TC-Ti. • Sleep Mode: If there is no operation for 30 seconds, screen will turn off. No operation for 30 minutes after the screen off, the device will enter sleep mode. • No e-liquid, No 18650 lithium-battery (Recommend high-rate discharge battery ≥35A). • Color will be sent by randomly. The resin style has its own unique psychedelic pattern. We could not guarantee the product you received has the same pattern as that in pictures. muy buen equipo, lo traigo para la venta y es muy confiable. un mod de los mejores del mercado, 100% recomendado. Muy contento con mi equipo. 100% original y funciona de mil maravilla, completamente recomendado. Articulo excelente. Muy comodo y elegante. El envio ha sido el mas rapido hasta ahora de todos los pedidos que he realizado. 157W VOOPOO Drag is use friendly, nice look and touch. The mod fires up quickly. Fast shipping. Sehr schnelle Lieferung, Produkt gut verpackt. VOOPOO Drag ist wirklich ansehnlich. Der Akku hällt locker einen Tag, sodass über Nacht laden ausreicht.